COLLIE O’NEILL said he does not care whatsoever who UCD are drawn with in the semi-finals of the FAI Cup, following his side’s impressive 2-1 victory in Friday’s quarter-final against Waterford. The Students have impressed in the SSE Airtricity League First Division all this season, with a win next Friday at home to Finn Harps securing the title and their return to top-flight football for the first time in four years. Goals from former Reading forward Conor Davis, who scored a hat-trick against Drogheda a week ago, and Timmy Molloy saw the hosts race into a two goal lead on Friday — with Stanley Aborah’s late penalty after 78 minutes only halving the deficit as UCD held on to secure a memorable victory. The win ensures their first appearance in an FAI Cup semi-final in 11 years — a feat which was unknown to their manager following full-time. The 42-year-old reflected that the victory was just reward for all his side’s efforts this season, where UCD have claimed 17 league wins from 25 games in the First Division. “Tonight was a free crack at a Premier Division team. I still would have swapped tonight for a win next Friday [against Finn Harps] to get us promoted. 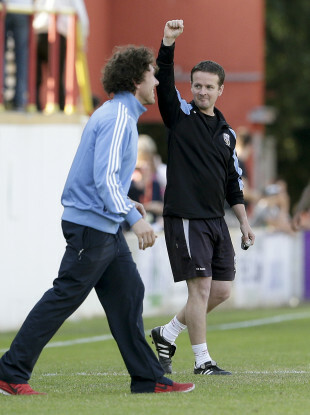 The Drogheda native said he did not care who UCD were drawn against in the final four. Defending champions Cork City booked their place in the semi-finals with a 7-0 drubbing of Longford Town. Last season’s beaten finalists Dundalk eased past Limerick 4-0, while Bohemians face Derry City on 19 September in the final quarter-final. “Couldn’t care less,” the UCD manager said when asked who he would prefer to face, as his side prepare for a first semi-final appearance since 2007. “Absolutely couldn’t care less. It’s another free crack at a Premier Division team and we’ll just go at it. Email “'I couldn't care less who we get in the semi-finals — we want to test ourselves against the best'”. Feedback on “'I couldn't care less who we get in the semi-finals — we want to test ourselves against the best'”.